"Now playing" track metadata, received by XMPP from Amarok (or somewhere else, like a radio station). Play controls for Amarok (XMPP). Similar artists (Last.fm), with pictures if no local albums. Linked to last.fm artist pages. Local albums (MySQL) for each similar artist, click to play in Amarok (HTTP). Musicbrainz info: web links (Discogs, Wikipedia, Myspace, etc), albums (green if available locally, click to play; red linked to source for downloads), band members. Last.fm info: artist bio, top tags. YouTube videos (moved this back into a single column already, it was taking up too much room). 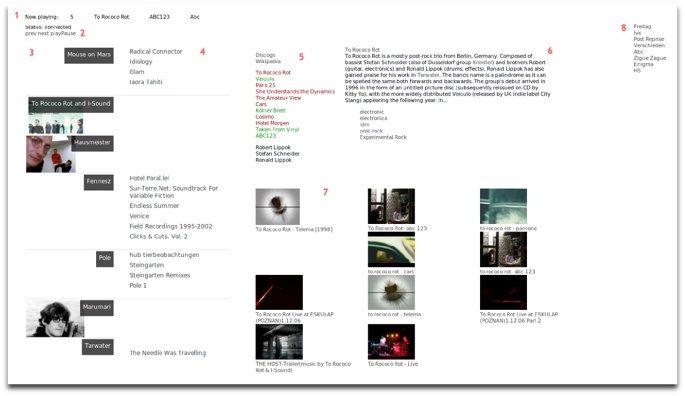 List of tracks from the currently playing album, shown on mouseover, click to play. TODO: Add an embedded BBC radio player widget at the top. After a period of inactivity everything should probably fade out and just show the album cover.